When he wasn't busy with agility training, Jeff managed a fair amount of progress on the garage this week. 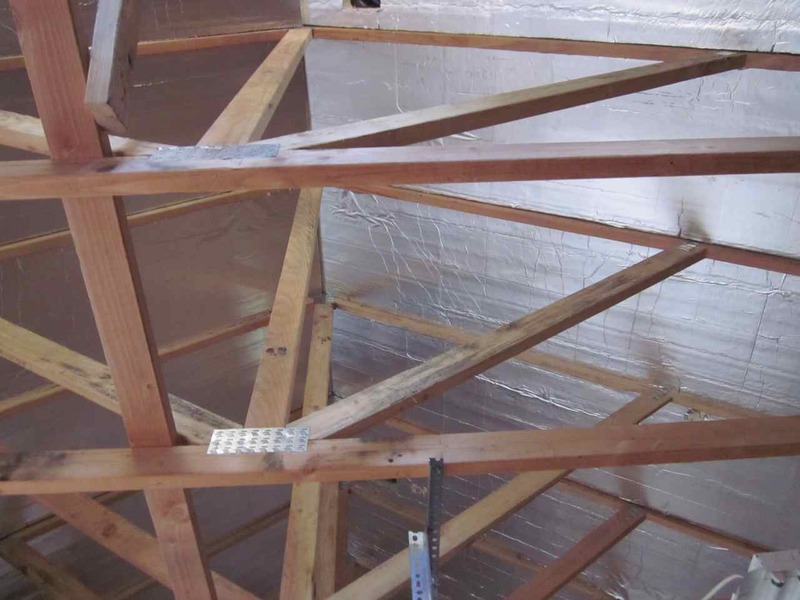 He found it easier to fit the rigid insulation in between the trusses by cutting down the pieces another 1/4-inch. (Just for the record, we used Rmax Thermasheath-3 in the 2" thickness; sold at Home Depot.) He still needs to finish filling in the lower edge, as the sheets were 8' long and there is about a 3' gap at the bottom. It has already made a big difference in the temperature in the attic—almost 20 degrees! 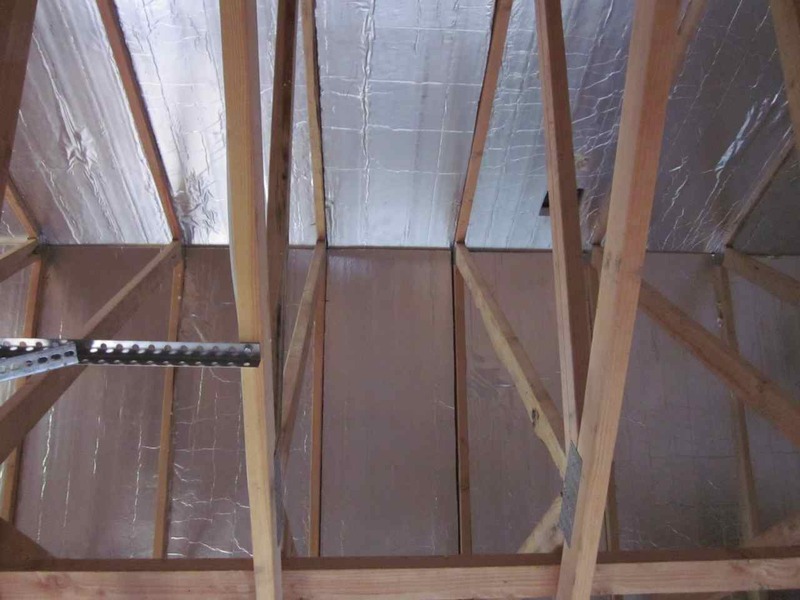 We're still debating about whether we should install a second radiant barrier over the top. For now, we decided not to sheetrock the garage as it's so much easier to move the electrical outlets and lighting while the wall framing is accessible. 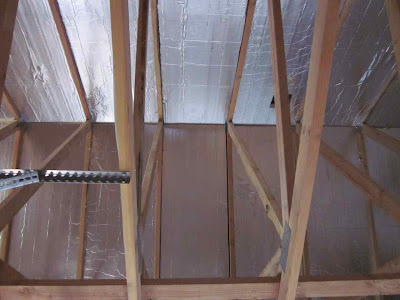 Once we get the shop set up, we will probably insulate and sheetrock the walls the rest of the way. Jeff also spent a few hours installing tool hanging technology. 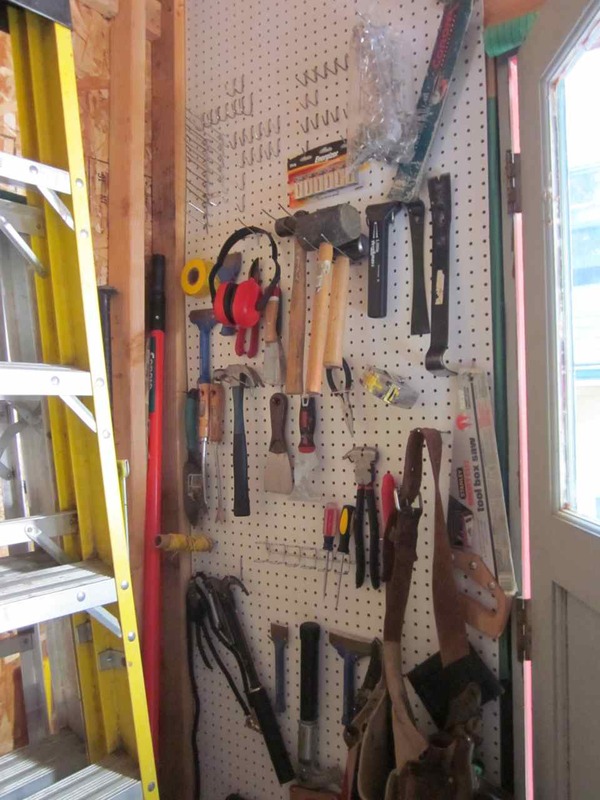 He installed the scrap of pegboard leftover from the workbench project on the short wall and I bought him a bunch of pegboard hooks so he could start organizing his hand tools. Jeff also got our large tool hanging racks hung on the wall. We've been storing our garden tools in a garbage can for several years, so it is nice to finally get them hung up and organized. I guess we can finally start moving stuff back into the garage from storage. On the paint stripping front, I totally lost motivation to work on it this week. But this afternoon I managed a bit of forward progress, by working on sanding the new linen cabinet doors. Looking great! 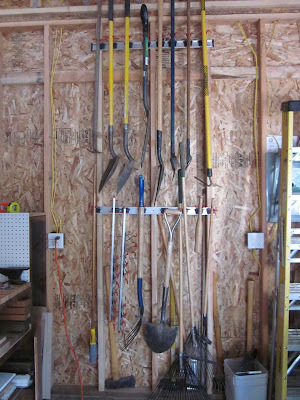 I need to organize my garage and put up a peg board. I have so much stuff!